The American Legislative Exchange Council (ALEC), the corporate bill mill that pushes “Stand Your Ground” laws like the Florida law that led to the killing of unarmed teenager Trayvon Martin, is now working to gut state laws that require electric companies use more energy from renewable sources. ALEC is also pushing laws to discourage people from putting solar panels on their own homes. “Renewable Portfolio Standards” (RPS) are laws that require power companies to derive a specific portion of their power from solar, wind or other renewable sources by a certain future date. So far 30 states have enacted RPS laws. In 2012, though, ALEC started pushing “model legislation” calling for the out-and-out repeal of RPS laws. Confidential ALEC strategy documents obtained by the UK Guardian newspaper reveal that ALEC calls such legislation the “Electricity Freedom Act.” So far, ALEC has engineered the introduction of such measures in about 15 states. ALEC is also pushing bills that level monthly charges on homeowners who install solar panels. ALEC calls such homeowners “freeriders.” In November, 2013, Arizona became the first state to enact a charge on homeowners for installing solar panels — a fee of about $5 each month. ALEC is attacking renewable energy on behalf of its big, extractive energy member companies. The companies want to block pro-solar policies to protect industry profits. 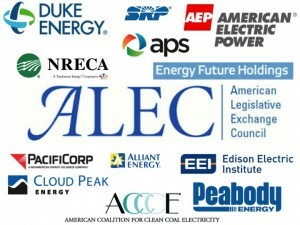 In 2012, ALEC sponsored 77 anti-renewable energy bills in 34 states. Other bills ALEC’s legislative members have introduced are aimed at banning oversight of fracking and advancing construction of the Keystone XL pipeline.